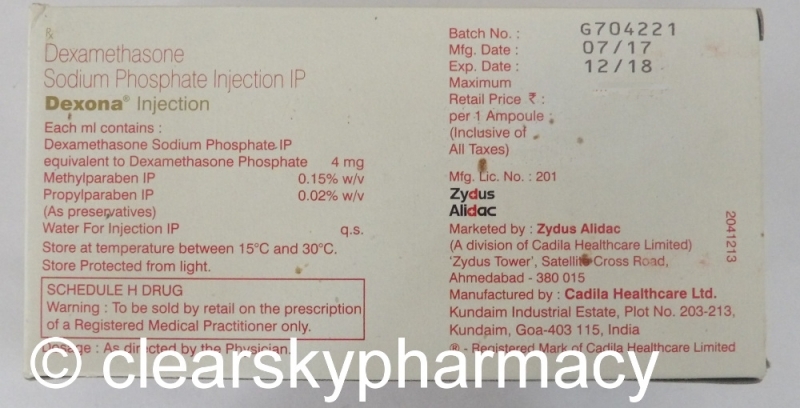 Dexamethasone Sodium Phosphate injection (Dexona injection), is a synthetic corticosteroid which acts as an anti-inflammatory and immunosuppressive agent. Dexona injection contains Dexamethasone as the active ingredient, which belongs to class of medications known as glucocorticoid steroidal drugs. Dexamethasone injection is used for the therapy of Collagen diseases (Systemic lupus erythematosus, polyarteritis nodosa, dermatomyositis, giant cell arteritis) Pulmonary disorders (Status asthmaticus, chronic asthma, sarcoidosis, respiratory insufficiency), Blood disorders (Leukaemia, idiopathic thrombocytopenic purpura in adults, acquired (autoimmune)haemolytic anaemia), Rheumatic diseases (Rheumatoid arthritis, osteoarthritis, adjunctive therapy for short-term administration), Skin diseases (Psoriasis, erythema multiforme, pemphigus, neutrophilic dermatitis, localised neurodermatitis, exfoliative dermatitis, sarcoidosis of skin, severe seborrhoeic dermatitis, contact dermatitis), Gastrointestinal disorders(Ulcerative colitis, regional enteritis), Oedema(Cerebral oedema associated with primary or metastatic brain tumours, neurosurgery or stroke,oedema associated with acute noninfectious laryngospasm (or laryngitis)), Eye disorders (Allergic conjunctivitis, keratitis, allergic corneal marginal ulcers, chorioretinitis, optic neuritis, anterior ischaemic optic neuropathy), Neoplastic states(Cerebral neoplasms, hypercalcaemia associated with cancer, leukaemias and lymphomas in adults, acute leukaemia in children)and Endocrine disorders(Adrenal insufficiency). Dexona injections are manufactured by Zydus Cadila Healthcare Ltd., India in the strengths of 4 mg of Dexamethasone per 1 ml of the solution. The cost of Dexona injection is only $0.42 per injection. We also have for sale Generic Dexamethasone oral tablets (Dexona) which are also used to treat the same indications. We have for sale original Dexona injections manufactured by Zydus Cadila Healthcare Ltd., India. 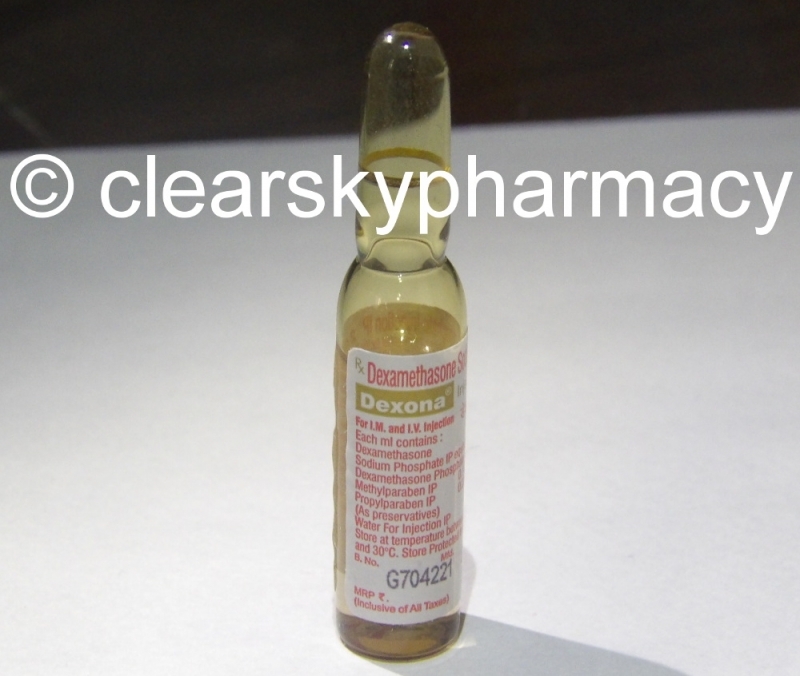 Dexona injections are also known as Generic Dexamethasone Injections. The active ingredient present in Dexona injection is Dexamethasone Sodium Phosphate. Each injection contains 2 ml of solution per ampoule. Each ml of Dexona injection contains Dexamethasone Sodium Phosphate BP equivalent to 4 mg of Dexamethasone. Dexamethasone Sodium Phosphate injection (Dexona injection) is used to treat inflammatory symptoms in various medical conditions such as pemphigus vulgaris, allergic dermatitis, eczema, exfoliative dermatitis, dermatitis herpetiformis, dermatitis medicamentosa, erythema multiforme, disseminated lupus erythematosus, dermatomyositis, polyarteritis nodosa, severe bronchial asthma and status asthmaticus, emphysema, pulmonary fibrosis, adrenal hyperplasia (adrenogenital syndrome), idiopathic thrombocytopenic purpura, acquired haemolytic anaemia, acute leukaemia, nephrotic syndrome, iridochoroiditis, ulcerative colitis, rheumatoid arthritis, ankylosing spondylitis, rheumatic fever, gout, periarthritis of the shoulder. Dexamethasone sodium phosphate injection, USP 4 mg/mL is for intravenous, intramuscular, intra-articular, intralesional and soft tissue injection. The starting dosage of dexamethasone sodium phosphate injection varies from 0.5 to 9 mg a day depending on the disease being treated. In less severe diseases doses lower than 0.5 mg may suffice, while in severe diseases doses higher than 9 mg may be required. The initial dosage should be maintained or adjusted until the patient's response is satisfactory. If a satisfactory clinical response does not occur after a reasonable period of time, discontinue dexamethasone sodium phosphate injection and transfer the patient to other therapy. After a favorable initial response, the proper maintenance dosage must be determined by decreasing the initial dosage in small amounts to the lowest dosage that maintains an adequate clinical response. 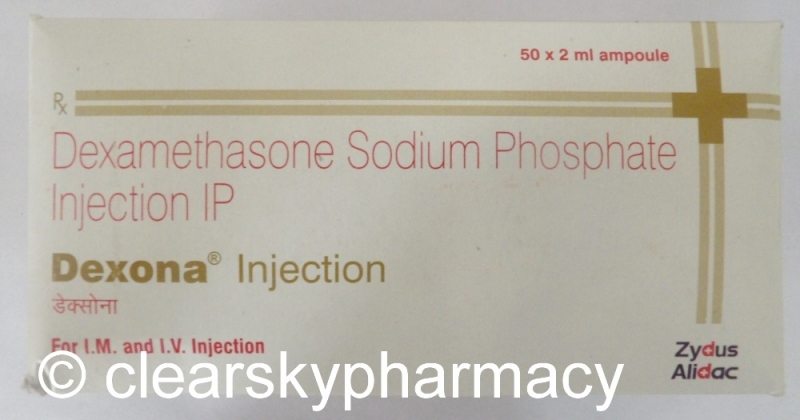 Store Dexamethasone Sodium Phosphate Injection (Dexona Injection) at controlled room temperature (68°F to 77°F, 20°C to 25°C). Protect from light. Sensitive to heat. Do not autoclave. Protect from freezing. Dexona injections are contraindicated in patients with a hypersensitivity to Dexamethasone Sodium Phosphate or any inactive ingredient present in Dexona injections. Dexona injections are also contraindicated in the following cases of Systemic fungal infections, hypersensitivity to other corticosteroids, administration of live virus vaccines and in patients with myasthenia gravis, peptic ulcer, osteoporosis or psychoses. Patients who have been administered high or prolonged doses of corticosteroids must be given supplementary corticosteroids to overcome periods of stress caused by anaesthesia, surgery or trauma. Long term treatment must not be abruptly stopped. Use Dexona injection only with extreme caution in patients with diabetes mellitus, infectious diseases, congestive heart failure, chronic renal failure, diverticulitis, hypertension, keratitis, epilepsy and in elderly persons. Intra-articular injection of a corticosteroids can produce systemic as well as local effects. Corticosteroids must not be injected into unstable joints. Patients must not be vaccinated against smallpox while undergoing treatment with corticosteroids. Inform your doctor immediately if you experience any of these side effects. This is not an exhaustive list of all the potential side effects of Dexona injections. Reports of acute toxicity and/or death following overdosage of glucocorticoids are rare. In the event of overdosage, no specific antidote is available. Treatment of overdosage is symptomatic. The dosage must be reduced or the medicine withdrawn. Anaphylactic and hypersensitivity reactions may be treated with adrenaline (epinephrine), positive pressure artificial respiration, and aminophylline. Dexamethasone Injection (Dexona Injection) has been classified by the US FDA as Pregnancy Category C.
During studies with animal, corticosteroids have been found to cause malformations of various kinds (cleft palate, skeletal malformations).These findings do not seem to be relevant to humans. Reduced placental and birthweight have been recorded in animals and humans after long-term treatment. Since adequate human reproduction studies have not been performed with corticosteroids, use of these medicines in pregnancy or in women of childbearing potential requires that the anticipated benefits be weighed against the possible hazards to the mother and embryo or fetus. Infants born of mothers who have received substantial doses of corticosteroids during pregnancy must be carefully observed for signs of hypoadrenalism. Corticosteroids like Dexamethasone appear in breast milk and could suppress growth, interfere with endogenous corticosteroid production, or cause other unwanted effects. Mothers taking pharmacologic doses of corticosteroids must be advised not to nurse. 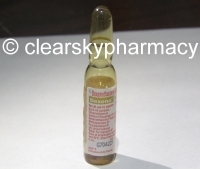 You can buy Dexamethasone injection online from Clear Sky Pharmacy at a cheap price. 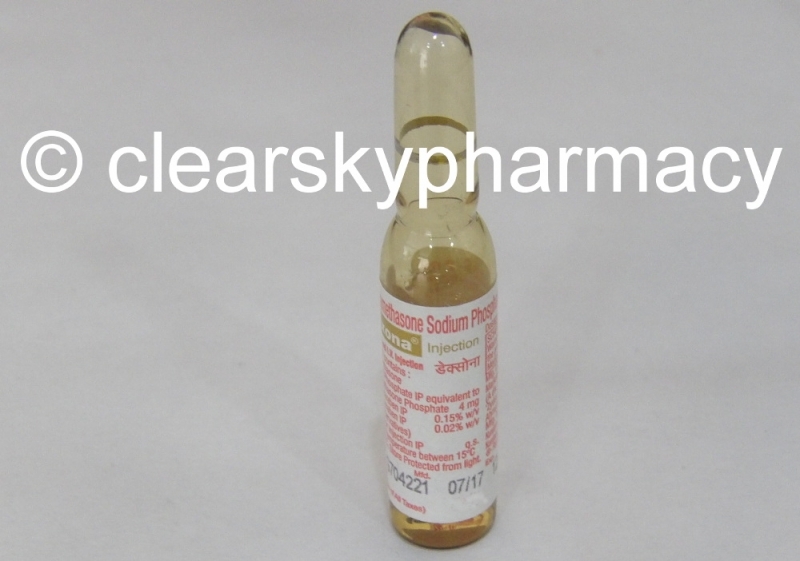 Dexona 4 mg injection, manufactured by Zydus Cadila Healthcare Ltd., India are supplied in a box of 10 vials. 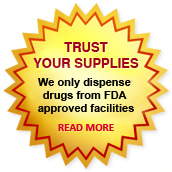 The 4 mg injections cost only $ 0.42 per unit when you place an order for 500 vials.